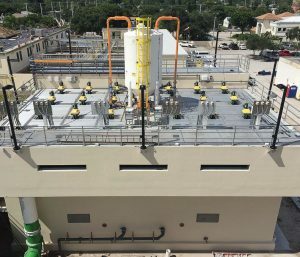 The Boynton Beach City Commission approved a partnership on March 2, 2015, allowing CDM Smith to begin the East Plant Ion Exchange and Upgrades Project. This partnership on the upgrades project led to the Envision Bronze award from the Institute for Sustainable Infrastructure in August 2017. In Boynton Beach there is an East Water Treatment Plant and a West Water Treatment Plant, both of which are operated by Boynton Beach Utilities. Each plant has its own water supply, and, historically, the East Water Treatment Plant draws from the wellfields to the east while the West Water Treatment Plant draws from the western wellfields. Rebecca Harvey, Boynton Beach Utilities sustainability coordinator, stated, “With increasing saltwater intrusion in the eastern coastal wellfields, this project was implemented to avoid saltwater intrusion and diversify water sources to reduce dependence on the eastern wells. “To shift to greater reliance on the western wellfield but utilizing the existing assets at the East Water Treatment Plant — where most of the increase in demand is expected — Boynton Beach Utilities installed a 6-mile-long raw water pipeline to connect the western wellfield to the East Water Treatment Plant.” With the water demands in the city projected to expand up to 25 percent, the pipeline provides up to 16 million gallons per day of raw water to support this future growth. However, the western wellfields contained high levels of dissolved organic compounds, as well as high color and hardness, when compared to the eastern wellfields. This required alternative processes to meet water quality needs. 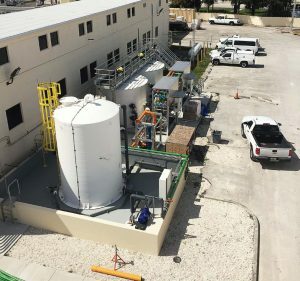 The East Water Treatment Plant Ion Exchange and Upgrades Project “added (a) MIEX ion exchange pretreatment system for removal of organic compounds from the western water to the existing East Water Treatment Plant,” commented Harvey. This means that the entire process is included in the East Water Treatment Plant, and following the western water’s passage through the pretreatment system, it is then treated by the existing lime softening treatment. 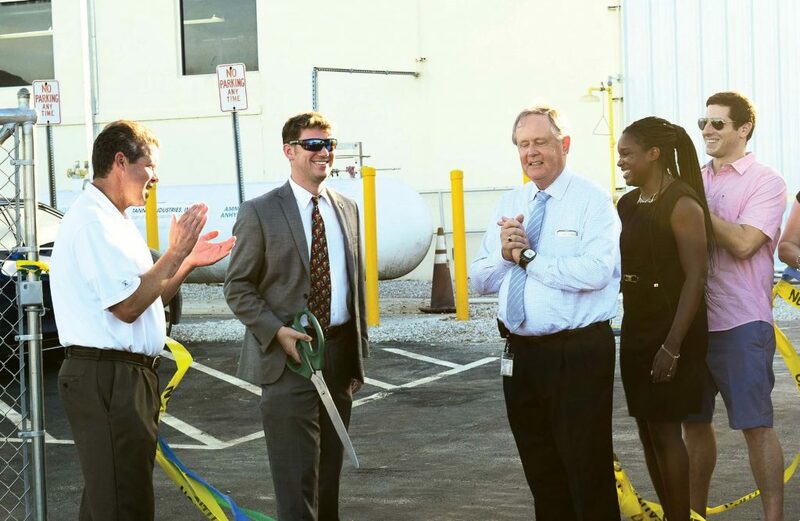 Following construction, Boynton Beach Utilities took charge of the plant’s operations. With the new upgrades, it is anticipating an increase in water treatment plant capacity; a significant reduction in color and disinfection byproducts; and a reduction in both the production of lime solids as well as chemical usage. While the primary contractor that handled all aspects of the project was CDM Smith, additional collaborators on the project included The Merchant Strategy; AW Architects; Tierra South Florida; Engenuity Group; Cooper Construction Management and Consulting; DCR Engineering Services; Carollo Design Build Group; and PCL, which installed the MIEX process. The Envision Bronze award received by Boynton Beach was one of only four granted in 2017 and the first to ever be granted in Florida. The Envision system judges sustainable infrastructure projects based on a range of environmental, social and economic impacts in five categories. These categories are quality of life, leadership, natural world, resource allocation, and climate and risk. A growing population for Boynton Beach meant the project was able to upgrade to support potable water needs for a growing and thriving community for many years. This project also ensures that a long-term potable water supply will be both protected and delivered in a reliable manner. The diversified water sources provided by this upgrade will help meet the community’s needs to reduce dependence on a surficial aquifer. Additionally, these upgrades will protect the drinking water supply from saltwater intrusion while benefiting the local environment. Best management practices were employed during construction for both erosion and turbidity control. This included protecting surface and groundwater resources by preventing runoff and pollution from leaving the site, and specific plans were created for spill and leak prevention, with the city continually monitoring the groundwater and providing monthly reports on the results. The project team worked with various local and state agencies, including the Florida Fish and Wildlife Commission. The commission identified particular habitats either on or around the project site. They then assisted in relocating priority species such as the gopher tortoises to another suitable habitat. A 1.8-acre onsite preserve was also created with a program that specified the removal of all invasive tree and brush species. The city has demonstrated a commitment to following principles of sustainability as well as sustainable performance improvement. In order to oversee the environmental needs of the community, a climate action plan and green task force were created. Mayor Steven Grant also signed the Mayor’s Climate Action Pledge. This made Boynton Beach a key partner in the Southeast Florida Regional Climate Compact. Utilizing the progressive design-build delivery method, the project team increased collaboration between the design and construction teams. This, in turn, optimized project delivery by reducing design elements that may have been conflicting. The majority of design issues that were encountered were also resolved before construction took place, which assisted in decreasing the number of change orders during construction.